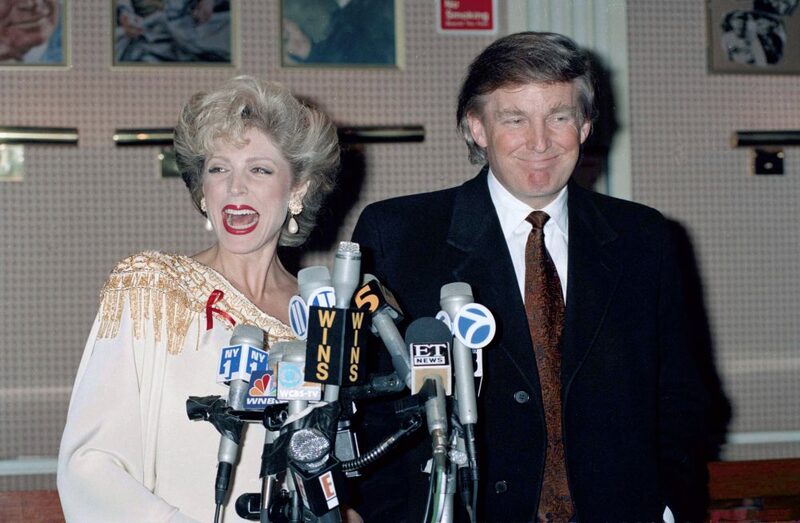 Trump with then-girlfriend Marla Maples at New York's Palace Theater, announcing they are expecting a child, April 7, 1993. Photo courtesy of Chrystyna Czajkowsky/Associated Press. Only one person born and raised in New York City has been elected President of the United States during the past 100 years: Donald J. Trump. Although Teddy Roosevelt won in 1904 (having acceded to the presidency after President William McKinley was assassinated), most successful politicians from New York City failed when they ran for president. This list includes Al Smith, Tom Dewey, Nelson Rockefeller, and Rudy Giuliani. By contrast, Donald Trump never made it in New York City’s business, cultural, or civic world. He’s neither rich enough to compete with multi-billionaires like Bloomberg, nor generous enough to qualify for the boards of cultural institutions like the Metropolitan Museum of Art or the city’s leading medical centers. In New York, you’re known for how much you give to museums or hospitals, not how much you have; New York tolerates any behavior but not intolerance and racism; and in a city of loudmouth mayors like Ed Koch and Rudy Giuliani, Trump’s mouth was a minor leaguer. In a city with 400 million square feet of commercial office space, having your name on a bunch of hotels and golf clubs does not mean much. That’s why he had to run for president: Almost no one admired or deferred to him in New York City. And he never went out of his way to pay attention to the city and its tragedies either. In fact, he had never even gone to the September 11 Memorial until the 2016 campaign when he invoked the 2001 attack to criticize his Republican nominee rival Texas Senator Ted Cruz. To understand how Trump emerged from New York City, and why he succeeded so well outside it, we must start in the borough of Queens. From the moment of his birth, Trump was an outsider, the son of an outer borough real estate developer. He was born in the Jamaica Medical Center, not a high-prestige Manhattan hospital, and he was a resident of Queens, not a wealthy Manhattanite. One of the five boroughs that make up New York City, Queens is a collection of self-contained communities, not a coherent jurisdiction. Queens’ reputation for detachment was famously established 50 years ago when Kitty Genovese was killed while her neighbors ignored her cries for help. It’s notable that the 1960s primetime television program that established Queens’ identity was “All in the Family,” a hit sitcom featuring the working-class anti-hero, Archie Bunker. Queens lacks the swagger of Brooklyn, which was once a separate city, or the spirit of Staten Island, which is part of New York City politically but culturally closer to New Jersey. And it’s a world away from the grittiness of The Bronx, which, despite hosting the Yankees, is also home to the poorest congressional district in the nation (and the nation’s largest wholesale produce market). Today, Queens is best known as the home of the U.S. Open, Kennedy and LaGuardia Airports, and the New York Mets, who never fail to find a way to fail. But it has a history of producing memorable personalities, among them Nancy Reagan, Martin Scorsese, Paul Simon, Cindy Lauper, Russell Simmons, and Harvey Weinstein. The most prominent residents of Queens, when Trump was growing up, were African Americans: Malcolm X, Louis Armstrong, Ella Fitzgerald, Count Basie, and Ralph Bunche. Trump was not even elite in Queens. He went to the undistinguished Kew-Forest School and then attended the New York Military Academy, rather than the nationally ranked Jamaica High School located near his home. Trump, whose father was of German descent and mother was a Scottish immigrant, lacked the pedigree, money, or education to gain entry into fancier circles. Trump’s father, Fred Trump, a real estate developer, lived in what was designed to be a gated, very white, insular enclave: Jamaica Estates, Queens. The Trumps didn’t live in either of the two higher-status neighborhoods of Queens: Forest Hills Gardens, well-known for its restrictions barring Jewish or African American homeowners, or Douglaston, adjacent to the Long Island Sound waterfront, where John McEnroe was raised. Since World War II, a German heritage has been a liability for prospective politicians in New York. In fact, the current mayor of New York City, Bill de Blasio, was born Warren Wilhelm, Jr., and was called Bill Wilhelm before he legally changed his name to Bill de Blasio, adopting his mother’s maiden name as his own just in time to run for city council. Trump then missed out on two opportunities that would have expanded his exposure to other cultural groups. Although of age for military service during the Vietnam War, he successfully avoided the draft with four deferments—and one medical deferment after college. [Trump’s] failure to make it into the upper echelon of New York’s business community is what drove him to run for president. He also entered adulthood just as white Protestants were declining in status and power in New York City. With the end of fixed commissions on Wall Street, and the advent of new information technologies, financial services became a competitive industry where brains replaced bloodlines. Instead of a Wall Street job, Trump graduated from college and returned to work in the family real estate business. As an ambitious young man, Trump found himself in the outer boroughs, which were, until recently, the minor leagues for real estate developers. Trump made the leap into Manhattan by using his father’s political connections and his own impressive negotiating skills to get control of the aging Commodore Hotel located next to Grand Central Terminal. With financing from the Hyatt Corporation, and a generous tax abatement from the city and state, Trump Tower was built in the 1980s, at 56th Street and Fifth Avenue, a prime Manhattan location. Today, it is best known as the Trump family version of Buckingham Palace. But these real estate successes were not followed by integration into the city. Trump couldn’t fit in, and he never actually owned many properties—he was focused far more on licensing his name, and attaching them to buildings, like a barbarian marking what he had seized. Trump never became a member of the Real Estate Board of New York, the leading organization of property owners in New York City. And the city’s major law firms and real estate consulting firms were reluctant to work for Trump, since he is known for not paying his bills. Most of the major commercial banks in New York refused to finance his real estate projects, especially once they became aware of his propensity to use bankruptcy laws to protect whatever money he had earned from projects, while hurting investors. In New York City, Trump, like any interloper, did take advantage of the tools available to him. Specifically, he manipulated the Manhattan-based mass media to create a national identity as a celebrity. Trump’s success was thus built more by maintaining a high profile in New York media, and then through national TV, as host of NBC’s The Apprentice, for 25 years, than by business acumen. The New York City tabloid newspapers loved to feature Trump, in stories about his three marriages and his calls for proof of President Obama’s birth. The front page of the New York Post is the equivalent of a daily billboard, which the local radio and television news programs treat as raw material for their evening programs. Trump was a master at getting the New York Post to cover his words, his wives, and his fights with Ed Koch and Barack Obama. He became famous as someone New Yorkers loved to ridicule. Trump didn’t care about being right or smart or ethical, only about being known. In 1989, he took out $85,000 in full-page newspaper ads calling for the death penalty after five young African American men were arrested for attacking the Central Park jogger. The charges against them were ultimately dismissed. But his career assaulting the political and cultural elites of New York taught him one lesson: Even a bad bully can have a fan club; you can succeed in life without being housebroken. News reports now have him marveling that New Yorkers who once wouldn’t give him the time of day—like the former Goldman Sachs chieftain Gary Cohn—now work for him. In light of his history, the Trump campaign promise to “take back America” was more than an empty slogan. It’s a genuine reflection of his inability to fit into the cultural and economic arena of New York City where he was never recognized as a person of consequence. Mitchell L. Moss is Henry Hart Rice Professor of Urban Policy and Planning at New York University. He grew up in Queens and graduated from Forest Hills High School. Moss was an advisor to Michael R. Bloomberg during his 2001 mayoralty campaign.